I had so much fun playing with our new Newton Unwinds stamp set! I love this image of the kitty playing with his ball of yarn! 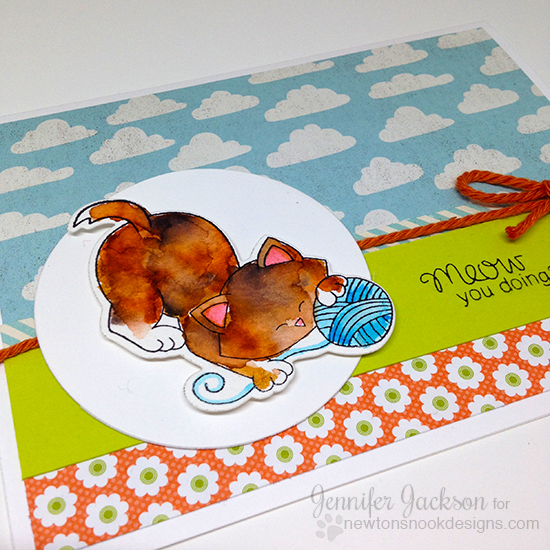 To make this card I stamped the kitty on some watercolor paper with waterproof black ink. Then I colored him using zig clean color markers - I love the fun bright colors these markers have. I mixed an orange, brown and black to give the kitty a soft of natural looking multi-colored fur pattern. I love how it turned out! Then I gave him a bright blue ball of yarn! I used the coordinating Newton Unwinds Die Set to cut out the kitty! To make this into a card, I added the kitty image on top of a white circle and added in some fun pattern papers with clouds and flowers from my stash (I admit, I'm a bit of a patterned paper hoarder!) I found a piece of bright green paper and added on the "Meow you doing?" sentiment, also from the Newton Unwinds stamp set. To finish it off I also added a bit of striped washi tape and some orange yarn. I thought the yarn tied nicely in since the kitty has his own yarn! LOL! Hope you enjoyed this card today! You can find these fun new products now at newtonsnookdesigns.com. Another sweet card! The papers are awesome and love the design! Oh SO cute!! Love the coloring of Newton! This is so cute! Love the way you colored Newton! Love the spring feeling on this super fun and cute card! So pretty! Sloth-some birthday card by Ka!